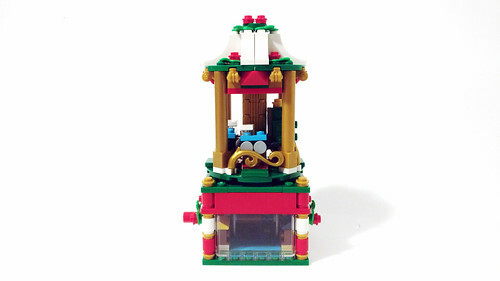 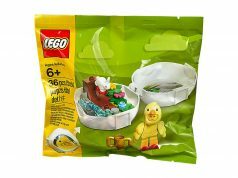 Starting tomorrow, LEGO will be starting a new promotion at LEGO Stores and on [email protected] for the new LEGO Seasonal Christmas Carousel (40293). 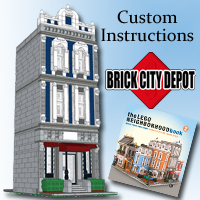 It consists of 251 pieces and you can get it from December 1-10, with purchases of $99 or more, while supplies last. 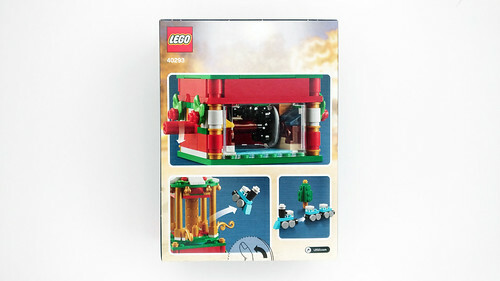 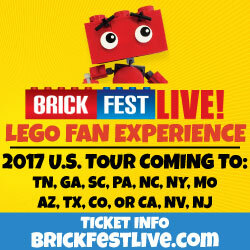 LEGO has kind enough to send over a copy for an early sneak peek at the set. 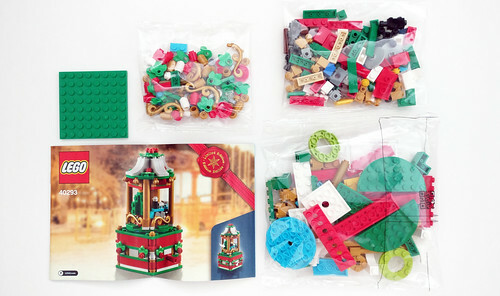 The contents of the box include three unnumbered bags, a loose 8×8 green baseplate, and the instructions. 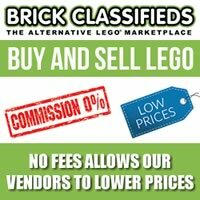 The is pretty straight-forward as you start at the pedestal. 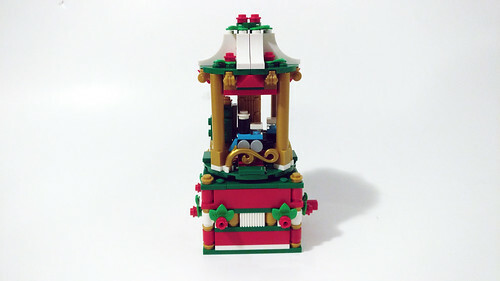 The outer edges are not too spectacular but one one side, there’s a clear window to see what’s on the inside of it which is the turning mechanism for the carousel. 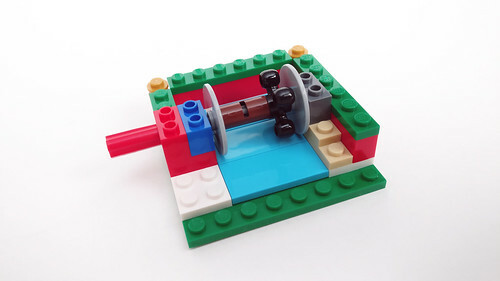 Speaking of the turning mechanism, it is basically a Technic angular wheel on a cross axle that rotates on the adjacent angular wheel when you turn the red cross axle. 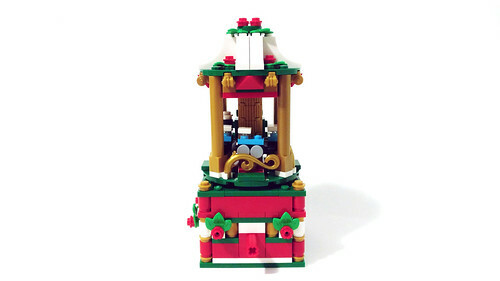 For the platform, it is under four pearl-gold poles and in the middle is a three car train as well as a small Christmas tree. 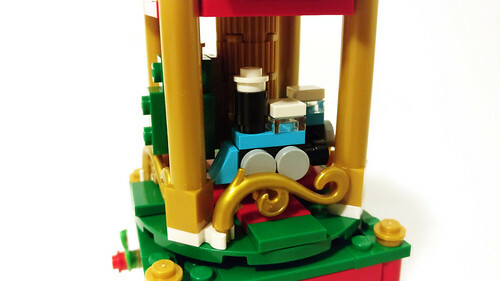 Some decorations on the platform include some pearl-gold vine pieces that open up to easily access the train and the tree. 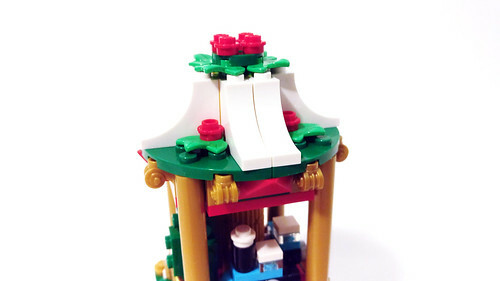 At the top are some white sloped bricks and some wreaths spread out. 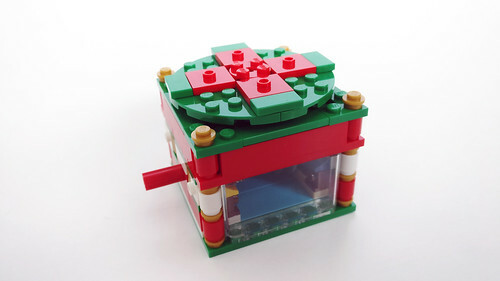 One thing I don’t like about this area is the little gap that the two half circle plates make because there’s nothing to hold the halves together. 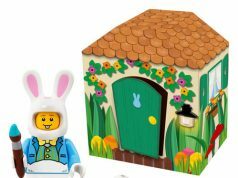 It’s not a big deal but you can’t unsee it once you see it. 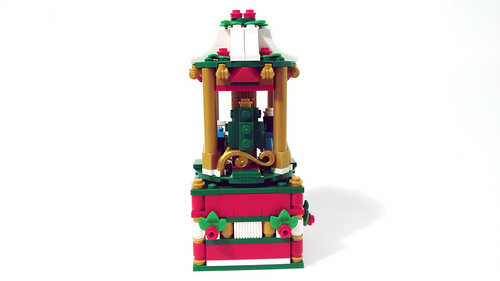 As we are coming to the end of the year, the LEGO Seasonal Christmas Carousel (40293) will be the last big promotional item that LEGO will be doing for 2018. 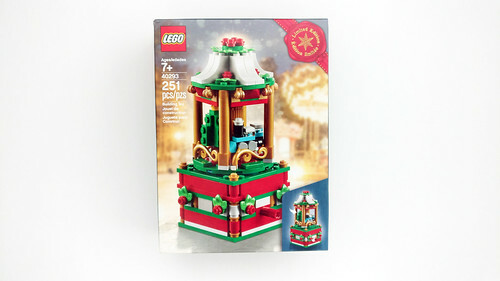 If you’re into the limited edition Christmas seasonal sets, you’ll probably want to pick this one up too. 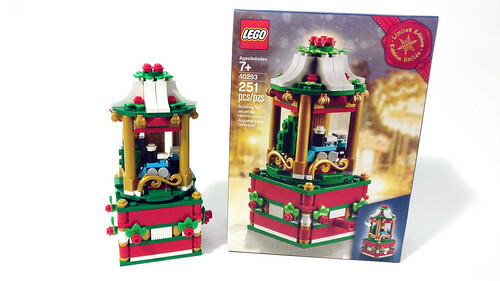 In my opinion, it’s not as good as the Snowglobe (40223) from a few years ago but it does complement it well. 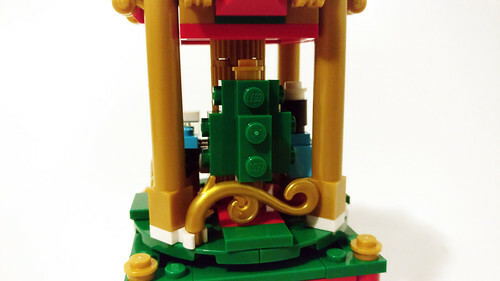 I don’t have much complaints about the Carousel except for the crack on the top but that’s about it. 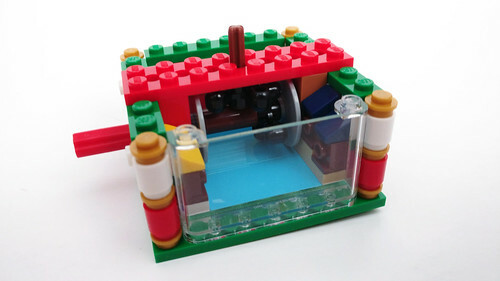 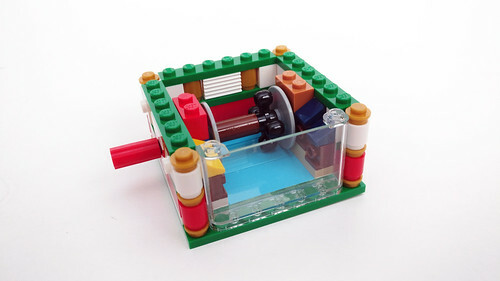 I do like how LEGO used a window piece for one side so we can see the inner workings of the turning feature. 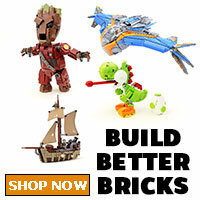 Again, this promotion should go online tonight and you can get it with a purchase of $99 or more.